Find out how TO3000 can embody the whole working team if you need one. It can be your personal accountant, assistant, and project manager. It saves your time doing routine work. TO3000 is used and trusted by thousands of freelance translators all around the world. Keep all your records in one place: contacts, files, marketing info, prices, quotes, invoices, and payments. Bring together all that you know about your customers, right down to their local time, so as to avoid accidentally waking up your favorite client in the middle of the night to follow up on a couple of things. TO3000 numbers workflow files automatically, assigning unique codes to each quote, invoice, job, or payment. It makes it possible to keep all documents streamlined. A separate folder is created automatically for every single client, creating a space to save client-related files to prevent redundancy and ensure clear organization. Deliver professional-looking estimates to your prospective clients and turn a quote into a translation job or project when a customer accepts your proposal. Develop attractive quotes to catch the interest of your clients by using custom prices or offering tempting terms of work performance. Create client jobs or projects based on quotes to avoid wasting your time on routine and repetitive manual tasks. Use available templates, which you can quickly transform and redesign where appropriate to meet your requirements. Anycount makes estimating the price of a translation job easier than ever. Since it's necessary to determine the volume of a job to identify its cost, you need a precise text-count tool. Anycount supplies careful calculation of words, along with characters and lines in your documents. Hidden text, comments, headers, and footers will not have been forgotten during the calculation, delivering credible results. Make light work of auditing and accounting through the TO3000 invoice management system. Have a keen sense of the pulse of pending or overdue invoices, business expenses, future payments, and debts. Keep track of completed jobs that have not yet been invoiced and don't hesitate to present a bill for translation services. 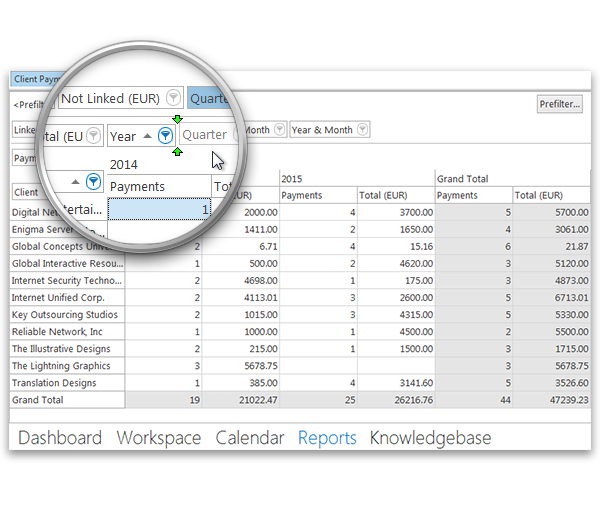 Create “phantom” invoices or “phantom” payments to write off miniscule amounts that are outstanding. TO3000 never lets your deadlines slide by. Check your schedule to set priorities right. 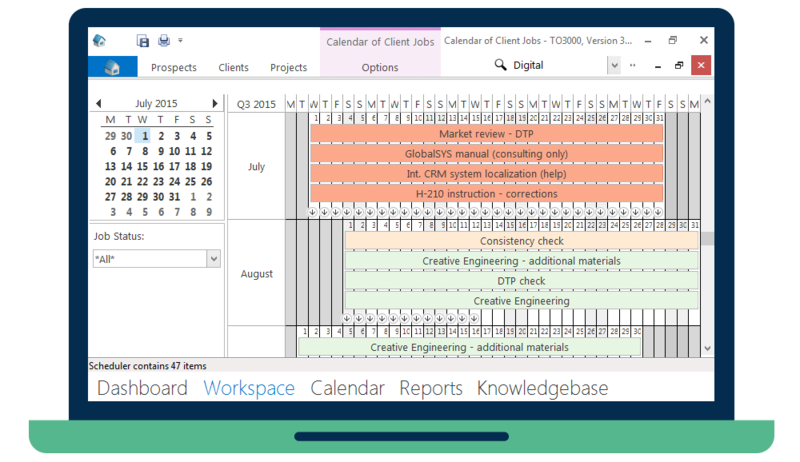 TO3000 allows you to review the timing of jobs and projects through the “Calendar of client jobs," which is presented in the form of a Gantt chart. Use filtering to view translation jobs that haven't been completed, that are on hold, or that have been planned. TO3000 3D combines many handy features and improvements. The new prospects module makes TO3000 a more complete freelance translation business management solution. It enables you to collect essential data about your leads, seamlessly follow up with them, and turn them into clients when the time comes. Because of the nature of a translator’s job, there will always be many foreign clients, and that means working with different currencies. 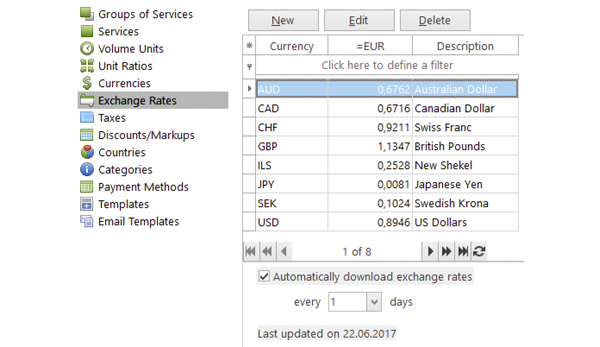 The new build of TO3000 3D allows rates to auto-update so you can quickly and easily convert from one currency to another. Send emails to your prospects and clients and attach related files and documents right from your translation management software. 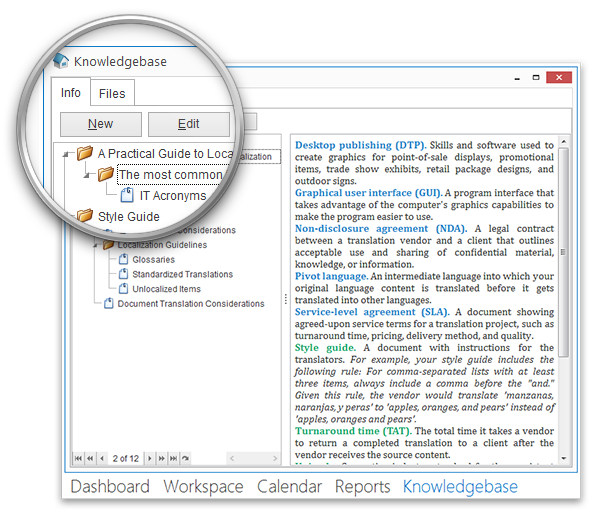 Build up a repository of valuable knowledge with the knowledgebase. Collect guides, instructions, help documents, professional publications, translation industry surveys, and other useful materials and access them at any time. Get insights into your translation business's performance and take advantage of a clear view of essentials at a glance. Now you can use widgets, which let you see relevant information about clients' jobs, invoices, and projects all on one screen. Keep a finger on the pulse of your finances with dynamic reports that provide definitive statistics about your business outcomes. Specify all the required parameters to put together a report that meets your needs. Find anything at any time with minimal effort. Perform case-sensitive keyword searches across the entire application with a global search. 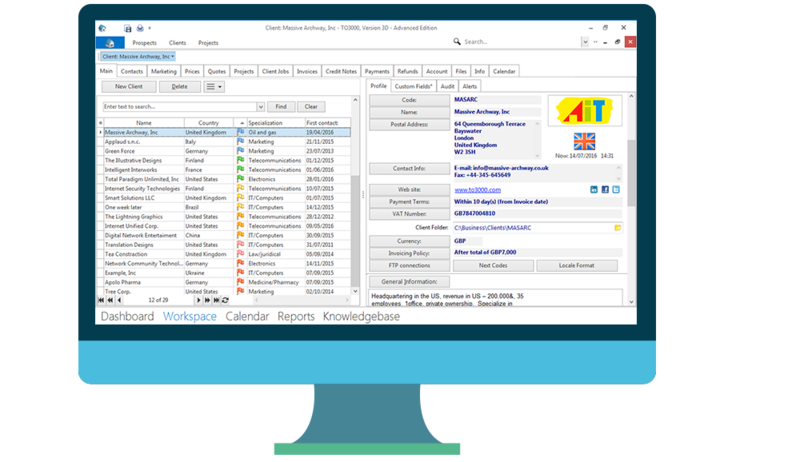 Define whether you want to search for people or objects, select the appropriate sections of your translation management software to refine your search, and then view the results in the relevant tab. I would wish to say that I am highly satisfied with TO3000. I use the program easily, find it highly configurable and effective. TO3000 is worth its weight in platinum! Thanks to it, my bookkeeping gave up being a nightmare and a mess and I never missed to send invoices in time (so being paid as timely as possible). Two thumbs up! I am very satisfied with Translation Office 3000; it's an excellent program and it really matches the needs of my business. I have recommended colleagues to use it in the past and I will definitely continue to do so. To download the latest version of TO3000, simply complete the form below and click the download button. Compare editions Looking for upgrade?